This past June I had the privilege to be invited as a Delegate to the first European Boutique Hotel Conference in London. I was representing BBLA as the exclusive Israel representative working closely with them to include Israeli Boutique Hotel memberships in this association. I write in my blog a lot about defining Boutique and Lifestyle boutiques and BBLA (Boutique & Lifestyle Lodging Association) is developing a platform that will create a professional standardization of Boutique Hotels. The conference was wonderful and I was able to network and make new friends in the Hospitality & Design world. I also had the opportunity to meet many developers and entrepreneurs trying to get involved in this growing sector. I am now being approached by many Boutique Hotel owners that want to become members of the BBLA. The lectures and content were interesting and inspiring and these can be seen on the conference website. 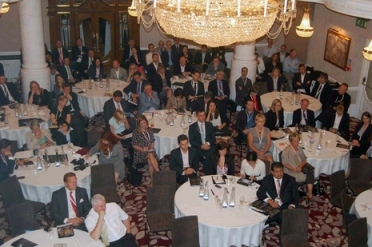 The delegates enjoyed a tour of two classic Boutique hotels in London, the St. James Hotel Club and the St. Ermins Hotel, where the conference was held. St. James Hotel is a traditional” club for travelers” concept with only 60 bedrooms. It is built in a very narrow structure with an impressive original staircase, open ceiling with hanging original chandeliers, silk wallpaper, private libraries and a private art galleries. The guestrooms have hand stitched mattresses, cashmere coverings and fine Italian furniture. The hotel has recently undergone a 60 million pound renovation/restoration project!! The hotel is affiliated with SLH Hotels and Altoff Hotels. St. Ermins Hotel is a Victorian landmark, with a “grand tour” concept and an impressive white spiral staircase at the entrance lobby going up to a mezzanine level and terrace areas. The designers have conserved the classic architecture but at the same time added modern amenities. The hotel , although considered a boutique hotel, has 331 rooms but in a historic long structured building with an entrance alley with gardens which hosts most of the adjacent British House of Parliament members. 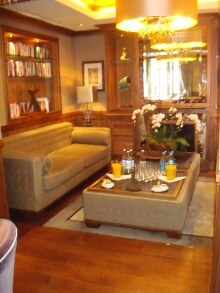 Lounge areas in the lobby area include more intimate reading and tea serving areas. The owners spent 20,000 pounds just to clean one of the chandeliers in this last renovation project. It was interesting that the hotel has a marketing affiliation with the Accor group through a very obscure brand called Mcgallery. I recommend you either visit or stay in these two iconic hotels next time you are in London. ← From London to Brussels: two Lifestyle brands within big Hotel Groups: two different concepts.